Coming down the hill into Drimoleague I saw a large concrete and stone church, built with no internal columns or divisions so I could see straight through it, ablaze with coloured light. Some of it came from plain yellow glass and some from an amazing concertina shaped window that is opposite the row of plain windows in the photo above. 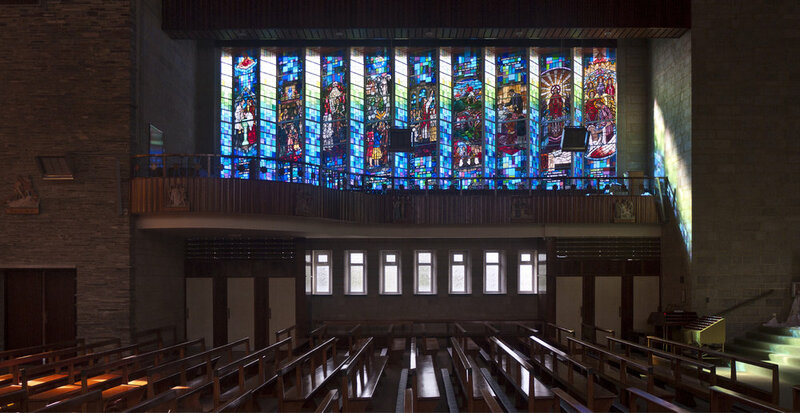 The church, designed by the modernist Cork architect Frank Murphy, was built in 1954-56 and the stained glass, from the studio of Harry Clarke, was installed in 1957. Although there are many interesting features in the building, including a huge mural behind the altar, I was drawn up the stairs to the gallery where I could get a close look at the stained glass. South side of the church: Interior with yellow glass - transparent over the entrance doors, opaque at the sides. The stained glass designer was William J. Dowling (1907-1980) who Harry Clarke had first employed in 1928 to help cope with an increasing number of commissions and who became the last manager of the studios up to their closure in 1973. The subject matter of the nine windows is the Catholic way of life, listed on the original design (which is in Trinity College Library) as 'Subjects adjust to Baptism, Family Prayers, First Communicants, Choosing Way of Life, The Mass, Work and Play, Extreme Unction, Judgement, Ascent of Soul to Heaven'. What makes the windows so interesting is that these scenes are set in 1950s Ireland. Row of windows on the south side of the church from the outside and the inside (above). 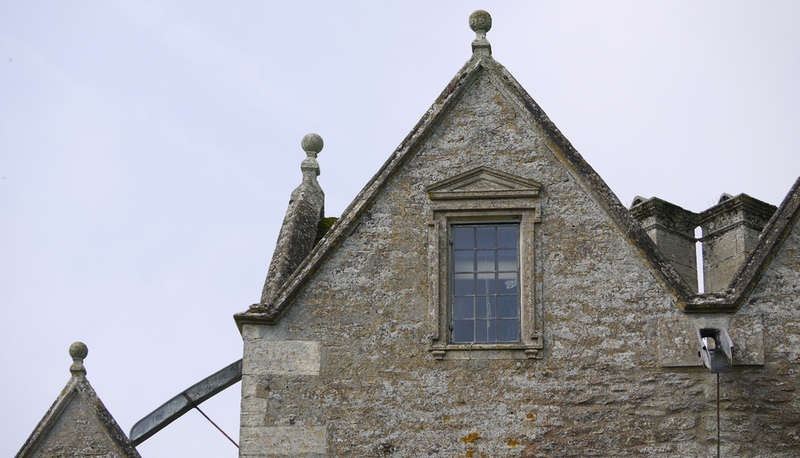 From the gallery, row of windows looking one way and the other. Half of the windows are made of blocks of bright uniform colours, these give out the blue glow that you see from a distance. In the morning sun, they also cast a strange blue glow on the face of the windows at the end of the sequence (above left). The same overwhelming colours are also used in blocks above and below the nine scenes. I was dazzled with bright colour, critical of the rather crude compositions and borders of some of the scenes (what would Harry think!) but so impressed with the actual figures and the painting of the faces. Close up to the panels, there are numerous gorgeous period details, from the furnishings, the clothes and shoes to the sandwiches and cups of tea (below right). My favourite groups of figures are the young couple having their baby baptised (above left), and the group wearing beautiful skirts and shoes pondering their futures - priesthood, religious life, marriage? (below left). Having spent the previous fortnight looking at windows by Harry Clarke made mostly in the 1920s, it was difficult to see the influence of the studio on these ones. However, a close up of the faces of the congregation at mass (below) shows a hand that knows how to paint an interesting, convincing person that doesn't copy Harry Clarke's idiosyncratic manner but updates it to a style that is very 1950s.